If a friend told you her aging mother had found a new salve that eased arthritis pain in her hands, you’d be happy for her, right? What if you noticed a co-worker missing fewer days from work after trying a new migraine prevention protocol – a good thing, no? What if both of them told you the treatment involved cannabis or “medical marijuana”? Do you feel the same? Setting aside the political nature of marijuana legalization for recreational use, today’s podcast focuses on all the ways compounds derived from the cannabis plant may offer health benefits and alternative treatments for a variety of illnesses. The importance of reaching out to a qualified practitioner and not simply relying on dispensary personnel for help finding the right products, varieties of cannabis, etc. As a cautionary part of this segment, we also acknowledge the reality that marijuana at present is still considered illegal on the federal level. Listeners who are interested in approaching its use as a medical treatment should be aware of the medical marijuana laws governing their state and of course, the policies that apply to them as an employee in their current job. To close out the show, I re-visit one of my favorite segments — If I Had A VCR I’d Tape This — with a look at three programs I recommend for Amazon Prime Video subscribers: Orphan Black, Catastrophe and The Americans. If these recommendations or this podcast in general resonates with you, I’d love to hear from you! You can either Find Me On Instagram or Tweet Me @ReganJonesRD, leave me a voicemail, join the This Unmillennial Life Facebook Group OR submit a show idea here! Never miss another episode! 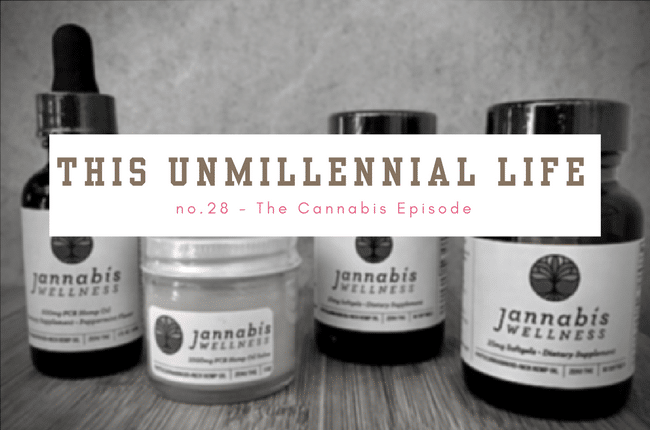 This Unmillennial Life is available each week via iTunes, NPROne, Libsyn and Spotify.